Country/roots historical release of the year? Sure—and maybe of the decade. 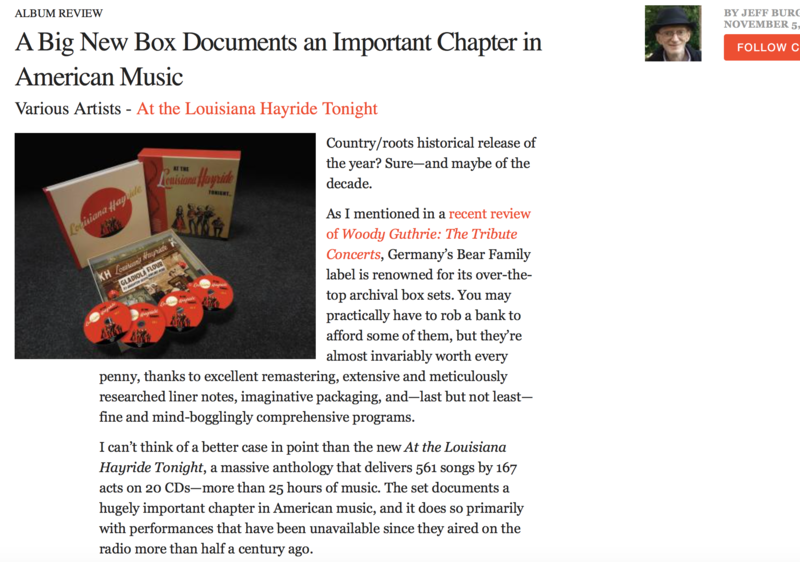 As I mentioned in a recent review of Woody Guthrie: The Tribute Concerts, Germany’s Bear Family label is renowned for its over-the-top archival box sets. You may practically have to rob a bank to afford some of them, but they’re almost invariably worth every penny, thanks to excellent remastering, extensive and meticulously researched liner notes, imaginative packaging, and—last but not least—fine and mind-bogglingly comprehensive programs. I can’t think of a better case in point than the new At the Louisiana Hayride Tonight, a massive anthology that delivers 561 songs by 167 acts on 20 CDs—more than 25 hours of music. The set documents a hugely important chapter in American music, and it does so primarily with performances that have been unavailable since they aired on the radio more than half a century ago. Broadcast live from Shreveport, Louisiana’s Municipal Auditorium on Saturday nights on KWKH-AM from 1948 to 1960, Louisiana Hayride never garnered quite as much recognition as the similarly styled Grand Ole Opry. That’s probably because the Opry focused on established stars while the producers of the Hayrideinterspersed big names with well-chosen unknowns. That’s one reason these broadcasts remain so valuable: probably no show discovered more future stars, and these CDs include seminal performances by dozens of artists who later became household names—many in country but others in rock, bluegrass, rockabilly, and pop. It was the Hayride that first gave wide exposure to Kitty Wells, Faron Young, Johnny Horton, Hank Williams, George Jones, Johnny Cash, Elvis Presley, and many other future headliners—and to such subsequently luminous backing musicians as Floyd Cramer, James Burton, and D.J. Fontana. Moreover, as this set repeatedly demonstrates, some of the Hayride artists who didn’t later make the big time were just as noteworthy as the ones who did. The first CD in this box sets the scene. It begins with a brief recording by W.K. Henderson, owner of KWKH, who rather hilariously bemoans the fact that stations with greater wattage are interfering with its signal in some parts of the country. Then come examples of pre-Hayride discs made for radio broadcast. The next 18 CDs contain highlights of its weekly shows, starting with the April 3, 1948 debut and ending with the August 27, 1960 finale. A final disc features material from the occasional Hayride programs that KWKH broadcast from later in 1960 through 1965 as well as promotional and commercial studio recordings, among them hits by the Browns, Jim Reeves, Mac Wiseman, and others. But the historic, frequently thrilling live concert broadcasts, which are presented in chronological order, are the main event. You’ll find, for example, four tracks by Hank Williams, including a previously unknown reading of “I’m a Long Gone Daddy”; seven numbers by rockabilly pioneer Warren Smith; 11 songs by George Jones; four selections from Roy Acuff; and eight tracks from Johnny Cash, including “I Walk the Line,” “Hey Porter,” and “Give My Love to Rose.” Also here: Slim Whitman, Ernest Tubb, Roger Miller, Marty Robbins, and Doug Kershaw, to name a few. Another highlight: 16 tracks from Elvis Presley, starting with an October 16, 1954 performance of “That’s All Right,” his first single, which Sun Records had released only three months earlier. “He has a new, distinctive style,” says the Hayride announcer, who asks Presley how he developed it. “Well, sir, to be honest, we just stumbled upon it,” Elvis responds. There’s more here than the featured singers’ performances. Louisiana Hayride was a sort of real-life Prairie Home Companion, with lots of atmospheric opening and closing themes, stage patter, and quirky commercials, and this set incorporates enough of all of that to make you feel as if you’re sitting by the radio half a century ago. Johnny Cash does a commercial for Southern Maid Donuts, for example, and an announcer invites radio listeners to come on down and attend one of the three-plus-hour broadcasts—which he says require an admission fee of 30 cents for kids and 60 cents for adults, plus one cent Louisiana sales tax. The music, too, is often wonderfully anachronistic. A hillbilly singer named Jerry Jericho delivers “I Wasted a Nickel Last Night,” in which he complains about spending five cents to call his girlfriend—only to reach a party line (ask your grandpa what that is) and overhear her tell a friend that he isn’t the one for her. When country artist Elsie Holly sings about there being no use in “pretending I’m gay,” meanwhile, she means there’s no point in acting as if she were happy. The set comes with an LP-sized, 224-page hardcover book that is almost as impressive as the performances. Loaded with fantastic period photos and detailed notes about the artists and their music, it also features an essay by reissue producer Martin Hawkins; an extensive overview of the Hayride broadcasts by Hank Williams biographer Colin Escott; a timeline of the shows that lists broadcasts and their artist lineups; and chronological and alphabetical listings of the box set’s artists and their performances. Perhaps you’re familiar with Harry Smith’s Anthology of American Folk Music, which first came out in 1952. That six-LP compilation of blues, folk, and country music from the late 1920s and early 1930s influenced a whole generation of artists. I have no doubt that the Louisiana Hayride shows had just as big an impact on those who heard them as did Smith’s anthology. The difference is that to experience the music of Louisiana Hayride, you had to be sitting in the audience in Shreveport or listening to a live broadcast. Thanks to this box set, that’s no longer the case.